I love a good blizzard. Always have. Always will. And monster cookies? Well, I have fond memories of Target's original Monster Cookie Ice Cream and Blue Bunny used to make one as well, but it's not something you really see in the freezer aisle. I got a cookie bit on the first scoop and it's very dry. I want to complain but when reading the description again, I realize it says cookie, not cookie dough, which means it's cooked, not soft. I realize being cooked is meant to set it apart from other blizzards, but there should have been double (if not triple*) the number of cookie bits in here. That, and some of them should have been blended in to oblivion to amp up both the cookie and peanut butter factors. In other words, this blizzard did nothing for me. I remember the peanut butter cookie dough smash blizzard having a stronger peanut butter vibe, almost a kin to it's Reese blizzard cousin, but I did not get that today. This just totally fell flat for me. To me, if "monster cookie" is in the name, I want monster flavor. The cookie vibe should be in my face and just dominating everything. That did not happen, not by a long shot. This blizzard reminds me of why I don't like M&M blizzards. I think I did when I was really little, but once I realized how much better other candies mix in to soft serve compared to rock hard M&M's, well, I gave up on them pretty much (except for the occasional twisted frosty). 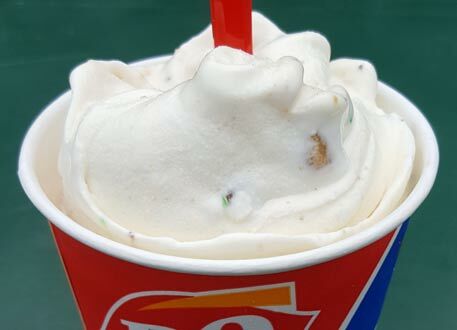 If you get this, go in knowing it's an M&M blizzard first and a peanut butter blizzard second. *Note #2: When you look on the internet and people got way more cookie bits than you did. AHHHHHHHHHHHHHHHHHHHHHHHHHHHH!!!!! My word, how hard would it be to get some quality control going on at Dairy Queen? This is ridiculous. It almost looks like they forgot to mix any peanut butter topping into your vanilla soft serve! Ice cream cake blizzard needs to be made. I mean literally no brainer. Oh no!! Too bad it's a disappointment. 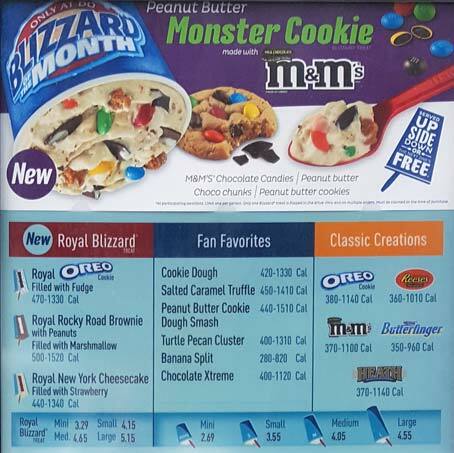 I wonder if this is the same monster cookie blizzard they had like a decade ago? Thanks for the tip Erin! I did a little digging and they did indeed have an original version and I have updated the post accordingly. Is DQ like Chipotle where you can be like, "a little more rice. (cookie dough) A little more. Ahhh... a little more please. Perfect." Or do they just give you whatever they feel like? I'm so glad that M&M blizzards do nothing for you because they do nothing for me either and I thought I was the only who felt this way. I don't know how some people like M&M's as mix ins because they don't blend well with the ice cream and are too hard. In cookies, they work well and taste great, and on their own, they are equally awesome. This is why I eat M&M's with a spoon because it mimics the experience of eating them as an ice cream mix-in. 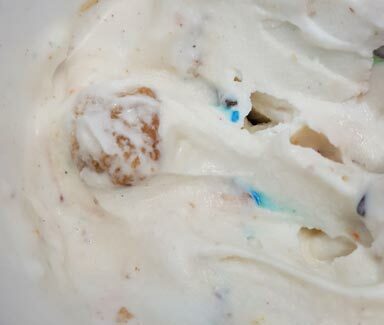 I actually love m and ms in ice cream. I prefer when they are already mixed in (like in a carton or from a stand) vs. adding my own so that they can soften a little and (ironically) melt a little into the base. Mini m and ms are excellent too and don't dominate. That was why I loved the old friendlys with the chocolate base, mini m and ms, marshmallow and chocolate swirls. And why the Breyers m and m was such a disappointment...now if they would make it with ice cream vs dairy dessert, we might be talking ! I've had this twice now from the SAME location. First time I didn't even notice a single peanut butter cookie in any scoop. Second time, SO MUCH COOKIE. Obviously the latter time was way better.